I have a 2008 VW Jetta SE with a 2.5L engine. My son uses this car to go to college and he came home one weekend saying his temperature coolant light was coming on and beeping. I checked and he had no coolant and I saw that the radiator fans were broken(missing or damage). I found that his water pump was also leaking so I replaced it. Refilled the car with coolant and then the fans would not turn on. I then replaced the radiator fans with brand new fans . I decided to replace the Engine Coolant Temperature Sensors as well. I drained all the coolant and replaced with fresh coolant specifically for European vehicles(purple coolant). And the fans would still not turn on when the engine was warm or when the A/C was turned on. I checked all the fuses with my multimeter in the engine compartment and all appear to be in working order. But this code, P0691, will not clear. I try to clear it and it keeps coming back. I applied power directly to the new fans and they turn on so I know the new fans work. So obviously, I have not fixed the issue and I am afraid that my lack of knowledge and experience has taken me as far as I can think of. Could you possibly know where or what I should be looking for? With this code I would check the connection to the cooling fan. When you say you supplied power to the fan was that both power and ground? or just ground? According to the wiring diagrams there are 4 wires that run to it. Check all 3 of the above for voltage using the brown wire as your ground in the 4 pin connector. The Yellow/Violet wire should be checked with the engine warmed up. Then check the above 3 wires with a good known ground. I supplied power and ground to the fans and they turned on. I also checked those fuses and they did not appear to be blown. Thank you to everyone who replied. Sorry that it has taken me a while to reply. So I think I found the culprit. It is a 50amp fuse(strip) that is on the fuse box next to the battery. I have attached a pic. I used a test light at the connection to the radiator fans. The test light did not light up. So I verified that it was attached to the negative post of the battery and tested it with my starter. The test light lit up. So my test light works. I tried testing again at the connection and nothing. So I went to the fuse box and check that I was getting power at the fuses and the test light did not light when I checked the bottom post of the fuse strip. Then I took it off of the fuse box and visually inspected it. And thats when I saw a crack on the filament inside the fuse. 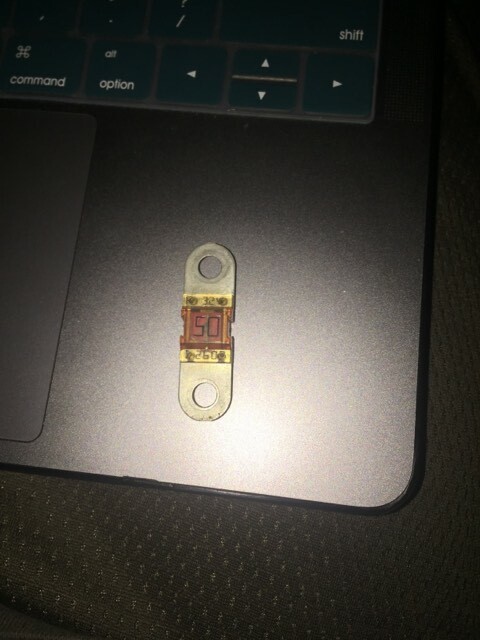 I don't believe my local auto parts store carries this type of fuse link so I will have to order it online and I am hoping that it resolves this problem.